E. De Clercq, Recent Advances in the Search for Selective Antiviral Agents. W. Durckheimer, F. Adams, G. Fischer, and R. Kirrstetter, Recent Developments in the Field of Cephem Antibiotics. R.R. Ruffolo and A.J. Nichols, Recent Conceptual and Experimental Advances in Drug Receptor Research in the Cardiovascular System. R.W. Fuller, The Pharmacology and Therapeutic Potential of Serotonin Receptor Agonists and Antagonists. P. Krogsgaard-Larsen, H. Hjeds, E. Falch, F.S. Jogensen, and L. Nielsen, Recent Advances in GABA Agonists, Antagonists and Uptake Inhibitors: Structure*b1Activity Relationships and Therapeutic Potential. Index. 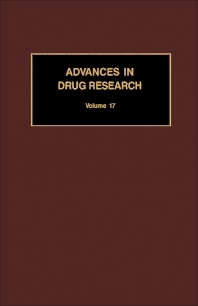 This volume comprises five authoritative reviews on timely topics in drug research. The first two chapters deal with chemotherapeutic agents (selective antiviral agents and cepham antibiotics) and subsequent chapters deal with the cardiovascular system and topics in neuropharmacology.